We are happy to announce that the next update of SQL Enlight is already here. 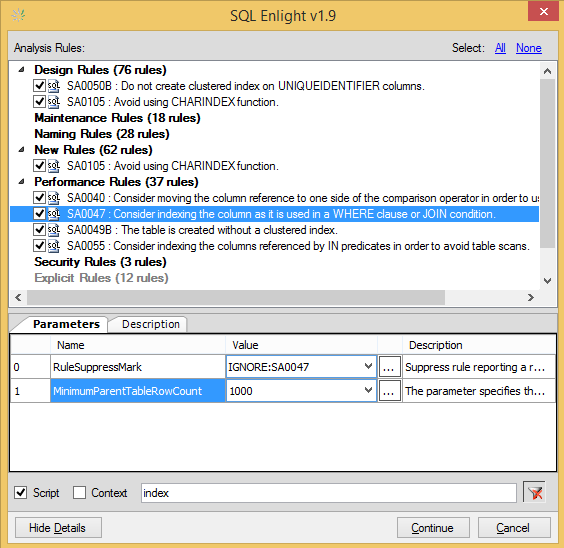 The new SQL Enlight version can be downloaded here and new version of SQL Enlight for SSMS can be downloaded here. Until now, only MVPs and trainers are entitled to free SQL Enlight Licenses. Now everyone who authors a custom analysis rule and shares it with the SQL Server Community can also get a free personal license of SQL Enlight For SSMS worth $145. What you will have to do? 1. Think of a new useful custom analysis rule and implement it. 2. Write a blog post that describes the practice, which it is enforcing and share the rule’s xml file. You have your rule and post ready, what’s next? Simply email your rule to rules@ubitsoft.com or send us link to a blog post describing the rule. 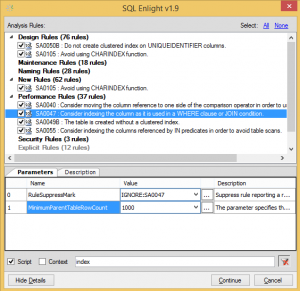 Once we check the rule we will give you a free SQL Enlight For SSMS license. First download and install the latest version of SQL Enlight or SQL Enlight For SSMS. The Analysis Rule Designer which comes with the tools is not limited by the trial period and you can freely use it to learn create and test your analysis rules. We are preparing a step by step tutorial for how to create a custom rule with SQL Enlight and will add a link to it in this post as soon as we have the tutorial published. Grant’s review gives a detail look to the features of the tool and its use. The article is recommended to anyone as an introduction to the tool.